It’s the stuff of 1950s and 60s double features that drives Katsuhisa Kigitsu’s stories of grotesque medical misadventure. Fran Madaraki is the creation of Dr. Madaraki, the most feared and respected mad scientist of his day. Her self-determined purpose in life is to advance science and spread happiness. Her methods are questionable, her skill at surgery is second to none, and she only wants to make the world a better place. At long last! Fans of the zaniness in Magical Girl Apocalypse and fans of the comedic mad scientist movie Young Frankenstein will finally have something to read together – Franken Fran! 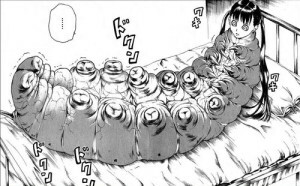 This is a highly entertaining horror manga. 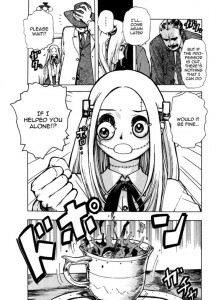 Tales of science gone amok populate the majority of Franken Fran omnibus vol. 1, and through them we begin to get a better understanding of Fran’s motives and philosophy. The episodic monster-of-the-week formula storytelling of Franken Fran works well in the same way that it worked for the first season of Supernatural – the setting is established and the main characters are introduced with only a minuscule amount of continuity. It isn’t until the very final chapter of the omnibus that we begin to see the beginnings of a larger plot involving other creations of the esteemed Dr. Madaraki. Fortunately we can learn more in vol 2 (coming out May 31, 2016). If Franken Fran were a live action movie it would have the concept art of Frankenstein’s Army, but with the special effects of Hell Comes to Frog Town. The monsters are comical, but classic in their design. In keeping with the mad scientist lead character you have wolf-men, eldritch monsters and sea creatures running around the lab at the same time that Fran is working to clone someone or sew fingers to the base of an animate, disembodied head. As one can imagine Kigitsu’s writing is humorous in a dry, horrible, hate-yourself-for-laughing way. It’s the same kind of humor that is found in watching a movie like Teeth or Bubba Ho-Tep. Humorous in a different way, the cover art is as misleading as the artwork on the box of a 90s video game. While the exterior would have you believe that this manga is all cheese cake, the rest of Kigitsu’s interior art is a cross between Shuzo Oshimi and Kaori Yuki‘s styles. The use of smooth tones and heavy shading works surprisingly well as the series is, after all, a shonen comic with a gothic, shojo lead. Not something you see too often. Katsuhisa Kigitsu is not new to the genre of fear. His skill as a storyteller and artist have resulted in numerous multi-volume horror/supernatural/suspense stories published in Japan. He even produced a promotional one shot for George Romero’s Survival of the Dead. Franken Fran, however, is the debut of Kigitsu’s work in North America. Thank you Seven Seas Entertainment. In testament to the fan excitement for this title are the numerous scanlation and fan sites that hosted Franken Fran before its licensure in April 2015. Seven Seas publisher Jason DeAngelis was quoted as saying, “ Franken Fran is one of our most requested licenses of all time… We already have such a passionate fanbase for monster girls—like for our bestselling series, Monster Musume —so Franken Fran is a great fit. It really pushes the envelope as both a horror and comedy.” Hopefully this will be a title that heralds more horror manga from Seven Seas, and which brings other works by Kigitsu to North America. If nothing else, then Franken Fran will at least sit proudly on one fan’s bookshelf between Drifters and Fragments of Horror.